Our staff at Medifocus is committed to keeping our subscribers to the Medifocus Digest Alert on Reflex Sympathetic Dystrophy abreast of the latest new research developments that have recently been published in the medical literature for this condition. In this issue of the Digest Alert, you will find a focused list of hand-picked journal article references that represent the latest advances in basic and clinical research for Reflex Sympathetic Dystrophy. These articles represent the current state-of-the-art of the research that will hopefully lead to additional major advances and breakthroughs in the clinical management of Reflex Sympathetic Dystrophy. You can access the summaries of each article referenced below by simply clicking on the article Title. We will continue to update you with the latest scientific and clinical developments through the Medifocus Digest Alert on Reflex Sympathetic Dystrophy every 3 months. Thank you for your ongoing subscription to this publication. 1: Comparison of complex regional pain syndrome and fibromyalgia: Differences in beta and gamma bands on quantitative electroencephalography. Institution: Department of Psychiatry, Seoul National University Hospital. Hospital, Seoul, Republic of Korea. Journal: Medicine (Baltimore). 2019 Feb;98(7):e14452. doi: 10.1097/MD.0000000000014452. 2: Clinical effects of pulsed radiofrequency to the thoracic sympathetic ganglion versus the cervical sympathetic chain in patients with upper-extremity complex regional pain syndrome: A retrospective analysis. Institution: Department of Anesthesiology and Pain Medicine, Incheon St. Mary's Hospital. ; Department of Anesthesiology and Pain Medicine, Daejeon St. Mary's Hospital, College of Medicine, The Catholic University of Korea, Seoul, Republic of Korea. Journal: Medicine (Baltimore). 2019 Feb;98(5):e14282. doi: 10.1097/MD.0000000000014282. 3: Intra-articular botulinum toxin injection in complex regional pain syndrome: Case report and review of the literature. Institution: Department of Physical and Rehabilitation Medicine, University of Padova, Via Giustiniani 3, 35128, Padova, Italy. Electronic address: giulia.bellon@studenti.unipd.it. Journal: Toxicon. 2019 Mar 1;159:41-44. doi: 10.1016/j.toxicon.2019.01.002. Epub 2019 Jan 17. 4: Investigate the Effect of Psychological Factors in Development of Complex Regional Pain Syndrome Type I in Patients with Fracture of the Distal Radius: A Prospective Study. Institution: * Department of Occupational Therapy, The University of Social Welfare and Rehabilitation Sciences, Tehran, Iran. Rehabilitation Sciences, Tehran, Iran. Rehabilitation Sciences, Tehran, Iran. Iran. Rehabilitation Sciences, Tehran, Iran. Rehabilitation Sciences, Tehran, Iran. Rehabilitation Sciences, Tehran, Iran. Journal: J Hand Surg Asian Pac Vol. 2018 Dec;23(4):554-561. doi: 10.1142/S2424835518500571. 5: Decision making process for amputation in case of therapy resistant complex regional pain syndrome type-I in a Dutch specialist centre. Institution: Department of Rehabilitation Medicine, University of Groningen, University Medical Center Groningen, Hanzeplein 1, PO Box 30.001, 9700 RB Groningen, The Netherlands. Electronic address: e.schrier@umcg.nl. Medical Center Groningen, Hanzeplein 1, PO Box 30.001, 9700 RB Groningen, The Netherlands; Department of Oral and Maxillofacial Surgery, University of Groningen, University Medical Center Groningen, Hanzeplein 1, PO Box 30.001, 9700 RB Groningen, The Netherlands. University Medical Center Groningen, Hanzeplein 1, PO Box 30.001, 9700 RB Groningen, The Netherlands. Groningen, Hanzeplein 1, PO Box 30.001, 9700 RB Groningen, The Netherlands. Medical Center Groningen, Hanzeplein 1, PO Box 30.001, 9700 RB Groningen, The Netherlands. Journal: Med Hypotheses. 2018 Dec;121:15-20. doi: 10.1016/j.mehy.2018.08.026. Epub 2018 Aug 29. 6: Patient consultation about a trial of therapeutic plasma exchange for complex regional pain syndrome. Institution: Department of Translational Medicine, Faculty of Health and Life Sciences, Pain Research Institute, University of Liverpool, Liverpool, United Kingdom. United Kingdom. Liverpool, United Kingdom. Journal: J Clin Apher. 2018 Dec;33(6):661-665. doi: 10.1002/jca.21662. Epub 2018 Nov 2. 7: Autoinflammatory and autoimmune contributions to complex regional pain syndrome. Institution: 1 Anesthesiology Service, Veterans Affairs Palo Alto Health Care System, Palo Alto, CA, USA. University School of Medicine, Stanford, CA, USA. University School of Medicine, Stanford, CA, USA. University School of Medicine, Stanford, CA, USA. Journal: Mol Pain. 2018 Jan-Dec;14:1744806918799127. doi: 10.1177/1744806918799127. Epub 2018 Aug 20. 8: Sensory modulation dysfunction is associated with Complex Regional Pain Syndrome. Institution: Department of Occupational Therapy, School of Health Professions, Sackler Faculty of Medicine, Tel Aviv University, Tel Aviv, Israel. Aviv, Israel. Aviv, Israel. of Medicine, Tel Aviv University, Tel Aviv, Israel. Aviv, Israel. Journal: PLoS One. 2018 Aug 9;13(8):e0201354. doi: 10.1371/journal.pone.0201354. eCollection 2018. 9: Hemisensory disturbances in patients with complex regional pain syndrome. Institution: School of Psychology and Exercise Science, Murdoch University, Perth, Australia. University, Mainz, Germany. Denmark. Denmark. Journal: Pain. 2018 Sep;159(9):1824-1832. doi: 10.1097/j.pain.0000000000001280. 10: Complex Regional Pain Syndrome after Total Knee Arthroplasty is Rare and Misdiagnosis Potentially Hazardous-Prospective Study of the New Diagnostic Criteria in 100 Patients with No Cases Identified. Institution: Exeter Knee Reconstruction Unit, Princess Elizabeth Orthopaedic Centre, Royal Devon and Exeter Hospital, Exeter, Devon, England. Journal: J Knee Surg. 2018 Sep;31(8):797-803. doi: 10.1055/s-0037-1615746. Epub 2018 Jan 2. 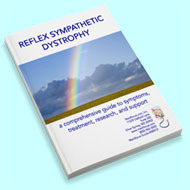 "Your MediFocus Guidebook on Reflex Sympathetic Dystrophy helped me understand my diagnosis. It gave me a clear insight into what the disorder is about and a way to find out about the treatments for RSD. It also gave me a way to inform those around me. Anyone who has RSD or knows someone who is diagnosed with RSD needs this easy to read and understand Guidebook." "I was recently diagnosed with RSD and I purchased the MediFocus Guidebook on this condition. The book was very well written and I immediately gave it to one of my doctors. With the help of the Guidebook, we were able to come up with a better treatment plan to help alleviate my pain. Sincere thanks." "I have been seen by some of the best RSD specialists in my area. Each of them told me there was nothing more that could be done for me. I became extremely frustrated and lost all hope of ever getting better. Many times I have searched the Internet for information about RSD and always came up with info I already had. I accidentally came across your website, ordered a book and was absolutely amazed at the amount of information now available to me. Although I have had you book only a short time, I have already discovered some new information. And with so many recent reports from doctors all over the world, perhaps I will come across some sort of treatment I haven't tried yet. The main thing is, I now have hope again thanks to your book. Thank you."